Antiplatelet agents are a typical therapy in preventing and treating cardiovascular events. Each patient has to be treated according to individual thrombotic and bleeding risk. When patients on antiplatelet agents present for surgery, the clinical team must chose optimal antiplatelet medications. In this case, clexane (6000 IU/0.4mL qd) was as a bridging agent. Patient had a good condition. 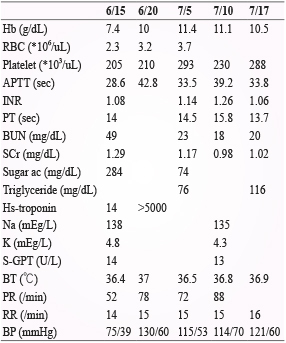 There were guidelines that provided clinical advice for the use of a bridging agent, including unfractionated heparin, lowmolecular-weight heparin, or glycoprotein IIb/IIIa inhibitors during the perioperative period. Some experts demonstrated that heparin has relatively minor effects on platelets, and does not prevent a thrombotic event. Bridging therapy with short-acting GP IIb/IIIa inhibitors can be considered. However, there are few numbers of clinical trials in the literature on GP IIb/IIIa inhibitors for perioperative management. The perioperative team should perform in a risk–benefit analysis of stopping or continuing each of antiplatelet agent. 2. Brieger D, Allan R, Conroy M, et al: Cardiac Society of Australia and New Zealand . Guidelines for the management of antiplatelet therapy in patients with coronary stents undergoing non-cardiac surgery. Heart Lung Circ . 2010; 19 (1): 2-10. 3. Korte W, Cattaneo M, Chassot P-G, et al: Peri-operative management of antiplatelet therapy in patients with coronary artery disease: joint position paper by members of the working group on Perioperative Haemostasis of the Society on Thrombosis and Haemostasis Research (GTH), the working group on Perioperative Coagulation of the Austrian Society for Anesthesiology, Resuscitation and Intensive Care (ÖGARI) and the Working Group Thrombosis of the European Society for Cardiology (ESC). Thromb Haemost. 2011; 105 (5): 743- 749. 5. Albaladejo P, Marret E, Piriou V, Samama CM, et Le Groupe de Travail: Management of oral antiplatelet treatment for patients with coronary stents. Ann Fr Anesth Reanim . 2006 ; 25 ( 7 ): 796-8. 7. Chassot PG, Delabays A, Spahn DR: Perioperative antiplatelet therapy: the case for continuing therapy in patients at risk of myocardial infarction. Br J Anaesth. 2007;99(3):316-28. 8. Oprea AD and Popescu WM: Perioperative management of antiplatelet therapy. Br J Anaesth 2013; 111 (suppl_1): i3-i17.